CLINTON, Tennessee - He was a born warrior, destined to protect his country and fight for the cause of democracy. It's only fitting that Army Staff Sergeant Daniel Morris died doing what he loved best. If one asked Daniel what he always wanted to do with his life, he would have told you he wanted to be an army man. The signs of his calling were visible in childhood. As a young boy growing up in South Clinton, Daniel dreamed of becoming a soldier. He built a fort in his backyard, attaching an American flag to it. He played with G.I. Joes and little plastic army men, and wanted to wear camouflage clothing. He also enjoyed playing paintball and the game Axis and Allies. Daniel was active in sports too. He played basketball with the South Clinton Optimist League and played soccer with the Clinton Optimist league. "He was all boy," said his mother Amy Morris with a smile. When he got older his favorite pastimes were hunting and fishing. "He never liked to sit still," she said. After he graduated from Clinton High School in 1996 and turned 18, he couldn't wait to join the army. But his father Glenn Morris asked his son to wait. At 21, Daniel couldn't wait any longer. He enlisted in the army and spent the next seven years living his dream. three-year stint in Bavaria, Germany and soon afterwards completed his first tour of duty in Iraq. His skill specialty was operating a Bradley Armored Personnel Carrier. "He loved his country," his mother said. Daniel, 28, died from injuries he received when a roadside bomb exploded near his Humvee Saturday, Nov. 25. He was on his second tour of duty in Iraq. The incident took place in the province of Diyala, northeast of Baghdad. Two other soldiers were critically wounded and another soldier suffered minor injuries in the same incident, according to the Morris family. Daniel is survived by his father Glenn, his mother Amy, his sister Cassidy, his brother Adam and his daughter Alexys. Amy said her son was always aware of the dangers of his profession. He faced the possibility of death with no fear. She said her son demonstrated an attitude of bravery as a child. When he was a young boy, he accidentally stepped on a piece of glass. He required stitches. Amy said he never once cried on the trip to the hospital. Arym SSG Daniel Marshall Morris is the first resident of Clinton and Anderson County to die in the Iraq war. Morris was killed when a roadside bomb exploded near his Humvee. 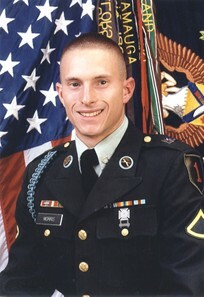 The 28-year old soldier was born May 15, 1978 in Oak Ridge and grew up in South Clinton. 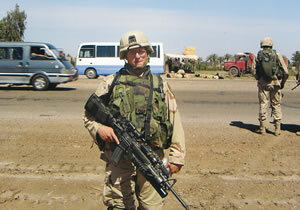 He is pictured while serving in Iraq. 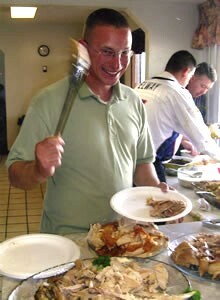 Daniel Morris enjoys a Thanksgiving meal in 2005 at Fort Hood, Texas. He was stationed at Fort Hood after he completed basic training at Fort Benning, Ga. in Jan 2000. 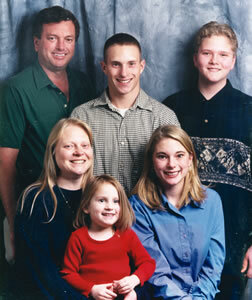 Morris with his family in 1999, just before he enlisted in the army. From the left counter clockwise is his father Glenn, his mother Amy, his daughter Alexys, his sister Cassidy, his brother Adam and Morris. "If Daniel cried, you knew he was in a lot of pain," she said. Amy said he kept up a brave front until the very end. Daniel told his mom to say these words if he should die on the battlefield: "You tell them I love God. I love my country. I love protecting my country. I died doing what I loved." Amy said her son was behind President George Bush 100 percent, which is why he reenlisted this year. She said that's why she can't speak against the war. "How he feels is what I feel," she said. But Amy admitted there were times she wanted to call President Bush and ask him to send her son home. Amy said Daniel would tease her and tell her that George wouldn't to listen to her anyways. "He served with pride," she said. Tears well up in Amy's eyes and she covers her mouth when she recalls the day she heard about his death. At 7:50 a.m. on Sunday Amy heard her dog barking outside. She went to her window to see what was going on. Two army officials were walking towards her door. She knew what the news would be. They started their announcement with the infamous words: "We regret to inform you that Staff Sgt. Morris has died…"
"They are very nice," said Amy about the officials. " But they are so formal." The last time Amy talked with Daniel was right before he left for Iraq in September. The last time she saw him was in June, when he came home to celebrate his daughter Alexys' 10th birthday. Glenn said the army officials came to his residence at 8:30 a.m. He said he went into denial when he saw the officials arriving at his doorstep. "You're hoping that they are going to tell you he is wounded," Glenn said. The last time Glenn saw Daniel was in July when he visited Fort Hood. The last time he talked with Daniel was two weeks ago. Amy said Alexys is holding up well and has declared she now has two angels: her father and her deceased dog Astro. "She's a trouper," said Cassidy, Daniel's sister. "She is just like her daddy." Amy said Daniel loved his family and kept in touch them via telephone and email. Amy admits that she hasn't erased nine messages from Daniel that sit on her answering machine. Daniel's brother Adam described his older brother as "quiet" and "goofy." His sister Cassidy would agree that Daniel was goofy. He liked to tease her, a price she had to pay for being the only girl and the middle child. She remembered an incident where Daniel took a picture of her with her hair up in rollers. He liked to show the picture to his army buddies. With a glint of humor in her eyes, Cassidy said Daniel was the one who always picked on her. "He would start it," she said. "I would never start it." Amy chuckles at her daughter's statement. "They rarely argued," said Amy. Amy said her son not only loved his family and his country, but had a love for God, too. "He was more religious than any of us," she said with laughter. Glenn said when Daniel joined the service he found religion when he served in Germany. This is the same kid who his father described as "wild" in his high school years. Amy said Daniel became stronger within himself and his beliefs. "He felt God was calling him to re-enlist," she said. Amy said her son wanted to go to Bible college to become a minister. He was an active member of New Testament Christian Church in Texas. Amy said her son was a "working Christian." She said he liked to invite people to church. She added he purchased a car just so he could drive people to church services. Amy said it's ironic that her quiet-spoken son chose to be a sergeant and a preacher, two professions that require speaking up. Glenn also laughs at the irony. "I guess he kept it balled up for special occasions," he said. Amy said a month before his death Daniel had an opportunity work as a chaplain assistant. He asked his mother to mail him some Bibles. Amy's voice broke when she mentioned a case of Bibles was still sitting in her car, waiting to be mailed. Glenn, on the other hand, made it his business to know what his son was up to. "I had a boy out there," he said. Glenn became familiar with military terms, followed the news closely and could determine where Daniel might be deployed next. Glenn said his son once told him he knew more than he did. "Hi Dad, Happy Thanksgiving to you also. I was going to call you the other day, but I couldn't remember your number. I am doing good here, and I am sure they are going to have a lot of food here for everyone. "They take care of us when it comes to getting chow. It is kind of cold here, but it just lasts 'till January or February. "I love and miss you all and hope you have a good Thanksgiving. Tell everyone I said 'Hi,' please. Love Daniel."